While dealing with PDF or Portable Document Format files, at times, you might want to extract all text from a PDF file. 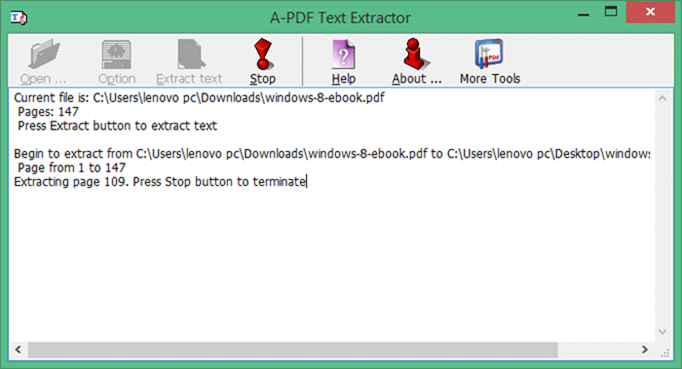 In this guide, we will show how you can easily extract text from PDF files or convert PDF files to text files in Windows with or without the help of online tools. The easiest and quickest way to extract text from PDF files is to use free online services. These online services don’t require any additional software, meaning you can get your job done without having to install any additional software on your PC. If below mentioned online services are not giving desired results or you would like to extract text from a sensitive that you don’t want to upload to a remote server, you can check out the free Windows software mentioned in Method 3 to 5. Also read our 6 ways to compress PDF files guide. 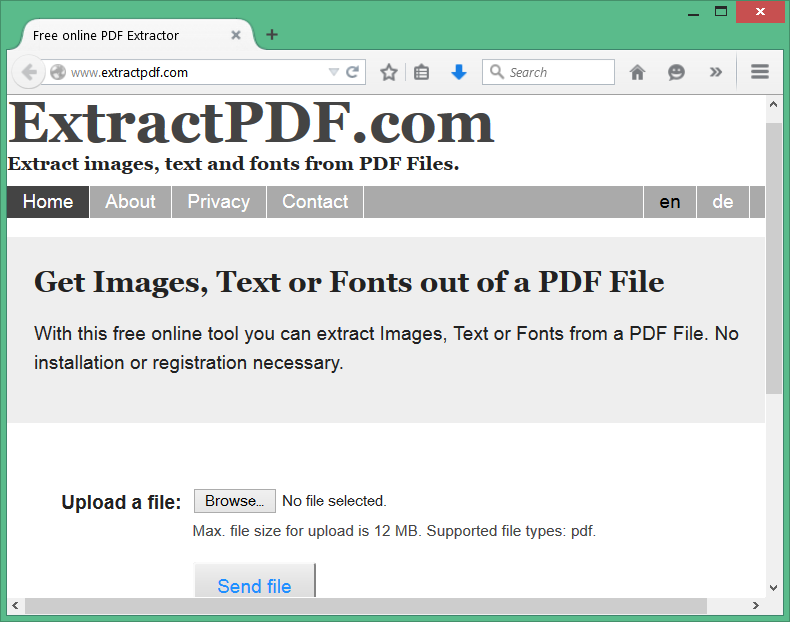 ExtractPDF is a free online service to full out text and images from PDF files. The service offers an easy-to-understand layout. After opening ExtractPDF page in your web browser, click the Browse button to select your PDF file, click Upload button to upload the selected file to ExtractPDF’s server and begin the extraction. As you can see in the above picture, the service doesn’t support files larger than 12 MB. This limitation shouldn’t be a program as most PDF files will be under 12 MB. During our test, we noticed that for some PDF files, the service doesn’t give desired output. If you’re having any issues with this service, check out the next one. Online OCR is an online tool to help you extract text from PDF files of less than 5 MB. 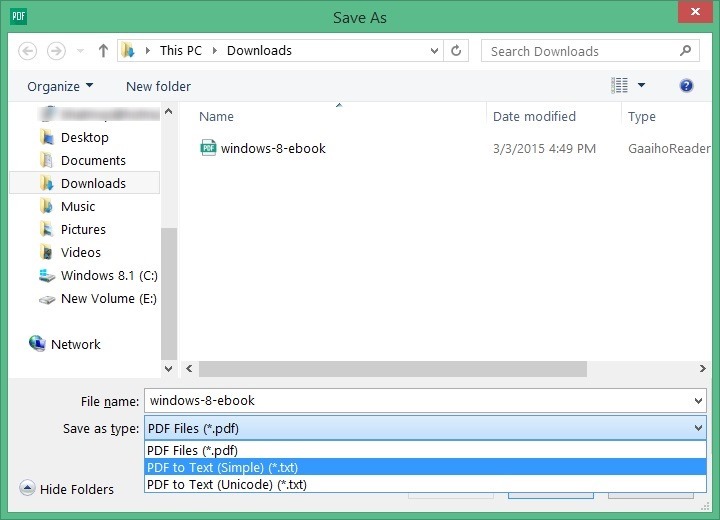 The service convert PDFs into editable Microsoft Word (.docx) or Text (.txt) files. Basically, STDU Viewer is a free software designed to open and view multiple file formats. In addition to that, the free version of STDU Viewer supports exporting text contents from PDF files. 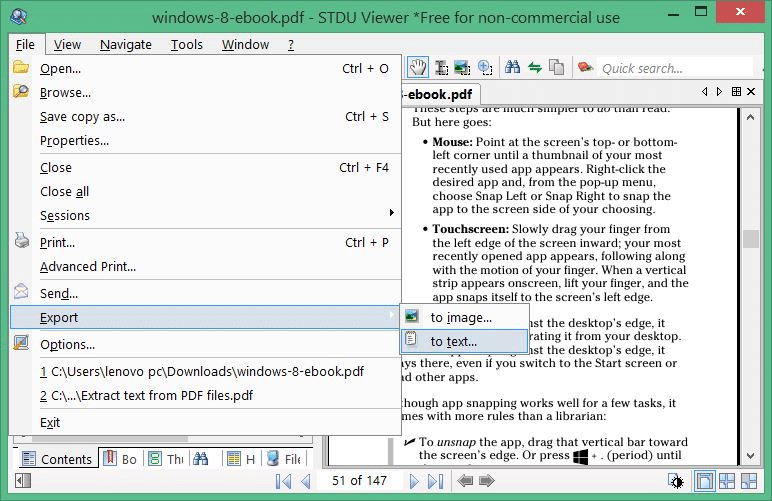 To export the text contents of a PDF file, open the PDF file with STDU Viewer, click File menu, click Export, click To text, select a location to save the new text file and then click OK button. The export option lets you extract text from a single, multiple or all pages. The download size of STDU Viewer is under 3 MB. The free version of STDU Viewer is for personal and non-commercial use only. 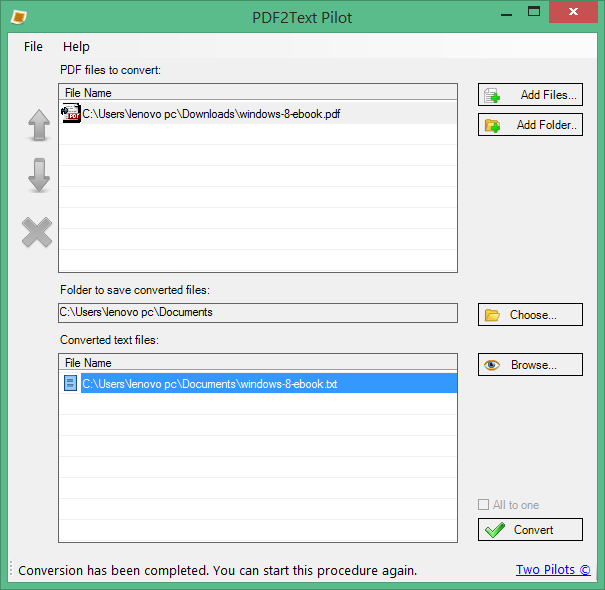 PDF2Text Pilot is a free software for Windows to convert PDF files to Text files with the click of your mouse. After installing and running the software, you just need to select the PDF file(s) that you want to see as text files, and then click the Convert button. Your converted files will be ready in a couple of seconds. The strength of PDF2Text Pilot is its simple interface and ability to convert multiple PDF files at once. A-PDF Text Extractor is another Windows software designed to extract text from PDF files. The software is absolutely free for both personal and commercial use. Gaaiho PDF Reader is an excellent piece of software designed to deal with PDF files. This free software offers a plethora of features that you can’t find other free PDF reader software. One of the features is the ability to extract text from PDF files with ease. To save a PDF file as text file, after opening the PDF file in Gaaiho Reader, click File menu, click Save as, and then select PDF to Text option from the drop-down menu next to Save as type. What do you think about these tools? Do you aware of a better free tool for the same job? Let us know in comments.